New Listing28" Black & Gold Beaded Necklace. 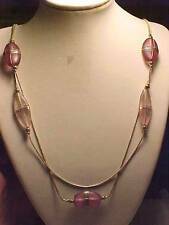 Included is Rhinestones, small and round in Pink, Purple, Amber and Clear faceted stones. About 36" in length. Black oval plastic beads in a tapering size, smaller at the top with lager beads at the bottom. Three Strands. Numbers 6:24-26 “The LORD bless you and keep you; the LORD make His face shine upon you and be gracious to you: the LORD turn His face toward you and give you peace.". Four horizontal gold tone bars at top add extra detail. All hardware is in working order. Amethyst Necklace Purple Beaded Necklace Double Silver Rope Chain 28"
Silver Plated Rope Chain Necklace with Lobster Claw Style Clasp. Purple Fashion Necklace. 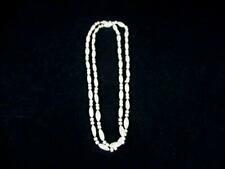 Size: 28" Beads 7/8" x 5/8" and 1-1/4" x 1/2". A VERY INTERESTING AND UNIQUE FEATURE OF THIS NECKLACE IS THAT THERE IS ONE LINK ON EACH SIIDE AMONG THE BEADS THAT ARE CUTE ANCHORS WITHIN A CIRCLE. They are a white iridescent twist bead. This is a beaded strand necklace by an unknown maker. Faux Multicolor Stone Beaded Collar Necklace 28"
Clasp Type: Lobster Claw Clasp. 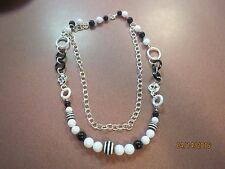 Jewelry Type: Beaded Necklace. Color: Multi-Color. Flaws: None. Period: Contemporary. Source: New. A fabulous piece!